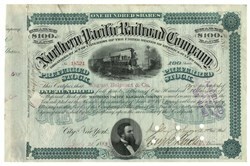 Home > Autographs > Business Leaders' Autographs > Northern Pacific Railroad Company Stock Issued To August Belmont & Co. And Signed On Verso By August Belmont 1883, New York. Northern Pacific Railroad Company Stock Issued To August Belmont & Co. And Signed On Verso By August Belmont 1883, New York. Stock certificate for 100 shares. GreenBlack. Engraved vignette of a steam locomotive at top center, nice portrait vignette of Frederick Billings at bottom. AUGUST BELMONT (1816 - 1890). Financier; Diplomat. At the age of fourteen, Belmont began working at the office of the Rothschilds in Frankfurt, Germany. His skill for finance won him numerous promotions within the company until in 1837, during the financial panic, he formed his own company in New York with his only tangible asset being that of his agency in the U.S. for the Rothschilds. Within a few years, Belmont was one of the leading bankers in the nation.